We'll Call You! Fill out this from and we'll call you to schedule your service appointment. 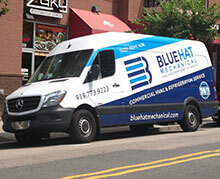 BlueHat HVACR’s comprehensive approach to service and maintenance will give your business and building management staff peace of mind through consistent comfort by design. BlueHat HVACR is a single-source building solutions provider of commercial HVACR, Heating, Ventilating, Air-Conditioning and Refrigeration services. Our unique approach includes an interview with you and your staff, a building assessment and recommendations to help with on-demand service repairs, diagnostics, emergency situations, as well as, retrofit and replacement services. 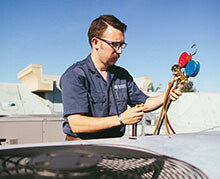 With an average of 20 years of experience in Commercial HVAC & Refrigeration Service, Maintenance & Installation, you can trust our technicians to fix it right. Our vehicles are on the road every day, so we can respond to most emergency calls quickly and get you back in business. 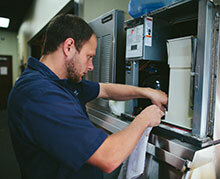 We’ll keep your equipment running smoothly so you can focus on growing your business and delighting your customers. BlueHat is here for you.